at First Bankcard's Secure Site. 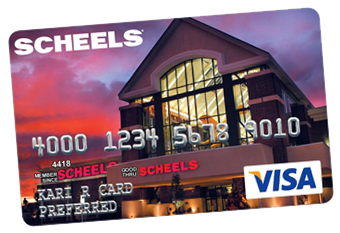 Scheels Visa Credit Card is a card that any regular Scheels shopper should consider. It features amazing benefits that allow you to accrue 3 points for every Scheels purchase and 1 point for every purchase made outside of Scheels. That is an amazing benefit. You don’t have to limit yourself to shop exclusively at Scheels in order to earn points. So you can feel confident in knowing that when you use your card for other purchases, or to pay household bills, you will still be accruing points. A unique feature that the Scheels Visa Credit Card offers is that they automatically send you a $25 gift card when you accrue 2500 points. That means that you don’t have to monitor your spending habits, or worry about points going unused and expiring. The Scheels Visa Credit Card does that for you. The Scheels Visa Credit Card allows you to customize your card by selecting the design that best fits your style. It also allows you to monitor your FICO bank card score via your monthly statement and when you access your account online so you will always know where your credit score is, without having to pay a service to monitor it for you. Another great feature of the Scheels Visa Credit Card is that it offers First Guard Zero Liability. This protects you from being responsible for any fraudulent purchase made with your card so you don’t have to worry about paying for items or services that you did not receive. This card isn’t only for people who have excellent, or even great credit. So if your credit score isn’t as high as you would like it to be, The Scheels Visa Credit Card still wants your business. It will provide you with the same features and benefits of more exclusive cards while you build your credit score. You don’t have to wait. The Scheels Visa Credit Card offers a lower APR for purchases and balance transfers made within the first few months of account opening. So if you have a balance that is accruing vast amounts of interest, or plan on making a large purchase in the near future, the Scheels Visa Credit Card is one that you should definitely consider. Earn 3 Points for every $1 spent on purchases from SCHEELS. Earn 1 Point for every $1 spent on purchases outside SCHEELS. $25 Gift card automatically send to you when you reach 2500 points. 1 Point = $0.01 credit towards Gift Card. Design your card. Choose your own image and customize the way you want your card to look. 0% Introductory APR for 6 Months from the date of account opening. 1500 Bonus points when you make your first purchase outside of SCHEELS.